It was a game of excess, played on a Friday afternoon in Philadelphia’s Shibe Park. Two teams combined for 104 plate appearances, 77 total bases, and 17 runners left on base. The first-place Yankees were playing the fourth game of a six-game series against the Athletics, who occupied fourth place in the American League, 5 games behind New York. The 5,000 fans at the game saw 33 runs, 36 hits, 9 home runs, 5 triples, 14 walks, 12 strike-outs, and 5 errors. On any other day, Yankees third baseman Tony Lazzeri would have owned the newspaper sports-page headlines. But on this day he was overshadowed by four different baseball events. On a day when Lazzeri hit for a natural cycle (single, double, triple, and home run in that order, the homer being a grand slam), Lou Gehrig amazingly hit four home runs and narrowly missed a fifth. On top of that, Babe Ruth launched his 15th home run of the season, second-best in the major leagues. Jimmie Foxx hit his ML-best 19th homer for Philadelphia. Still more headline-worthy, John McGraw announced that he was retiring from baseball after 29 years as manager of the New York Giants because of a two-year battle with a serious sinus condition. According to the New York Times, “Largely because of Gehrig’s quartet of tremendous smashes the Yankees outstripped the Athletics in a run-making marathon, winning 20 to 13, after twice losing the lead because of determined rallies by the American League champions.”1 Gehrig joined the Boston Beaneaters’ Bobby Lowe (May 30, 1894) and the Philadelphia Phillies’ Ed Delahanty (July 13, 1896) as the only players to collect four home runs in a game. In the first and fifth innings, Gehrig hit his bombs beyond the fence in left-center field, and in the fourth and seventh, he cleared the wall in right field. With the home run in the fifth inning, Gehrig became “the first man in baseball history to ever hit three home runs in one game for the fourth time.”2 On top of that, that third home run was a back-to-back-to-back shot, as Earle Combs and Ruth had homered ahead of him. George Earnshaw started for the Athletics and pitched five innings, allowing seven runs (six earned). His counterpart for the Yankees, Johnny Allen, gave up eight runs (four earned) in 3? innings. Allen was ejected by home-plate umpire Harry Geisel in the fourth inning for “bench jockeying,” the usual phrase used when a player argues balls and strikes from the dugout. The Yankees committed five errors in the contest (Ruth, Gehrig, Frank Crosetti with 2, and Allen). The Yankees used five hurlers and Athletics four, and all nine pitchers in the game allowed at least one run. Jumbo Brown picked up his first win of the season in relief, and Lefty Gomez earned his first save. Reliever Roy Mahaffey took the loss for Philadelphia. Lazzeri stroked five hits in six at-bats. In addition, he stole a base. As of 2015, he was one of only 14 major leaguers to have a natural cycle, and was the only one whose home run was a grand slam.5 With his five hits, Lazzeri’s average jumped to .357, third-best in the American League. Lazzeri and Gehrig each drove in six runs in the Yankees victory. Every starting position player for New York drove in at least one run. Doc Cramer and Ed Coleman led Philadelphia with three RBIs each. The game seesawed back and forth. The Yankees scored twice in the first, highlighted by Gehrig’s first home run of the game, a two-run shot. The Athletics responded with two runs in the bottom half of the first, with a Mickey Cochrane home run. 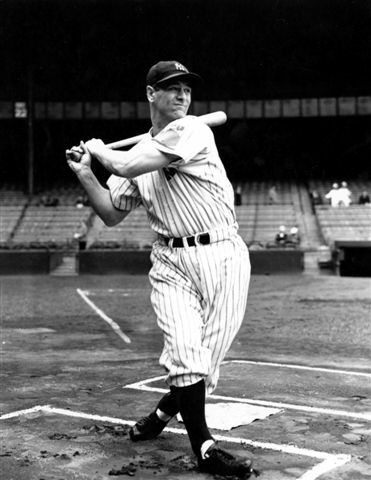 Gehrig’s second blast, a solo homer, was part of a two-run fourth inning for New York, but then Allen allowed six Philadelphia tallies in the bottom of the fourth, before he was chased from the game. New York seemed to have batting practice, scoring in each of the final six frames, with two runs in the fourth inning, three in the fifth, two in the sixth, three in the seventh, two in the eighth, and six in the ninth inning, capped by Lazzeri’s grand slam home run to give him the cycle. Gehrig’s missed home run could have meant an even higher score. Philadelphia scored twice in the bottom of the sixth for a short-lived lead, and the A’s added two runs in the eighth and a Jimmie Foxx solo home run in the bottom of the ninth. The final score: New York 20, Philadelphia 13. 1 “Gehrig Ties All-Time Record With Four Straight Home Runs as Yankees Win,” New York Times, June 4, 1932. 2 Ibid. Since Gehrig hit these four home runs in the same game, 14 more players have accomplished the feat, for a total of 17. Interestingly, when Philadelphia’s Ed Delahanty and Atlanta’s Bob Horner (July 6, 1986) hit their four home runs, their teams lost the game. 4 “Classic Yankees: Tony Lazzeri,” http://bronxbaseballdaily.com/2011/09/classic-yankees-tony-lazzeri/. 5 “Hitting for the Cycle Records,” http://baseball-almanac.com/feats/feats16d.shtml. 6 “Gehrig Ties All-Time Record With Four Straight Home Runs as Yankees Win,” New York Times, June 4, 1932. 7 “McGraw is Lauded by Baseball Men,” New York Times, June 4, 1932. 8 “Mrs. Terry, in Memphis, is Overjoyed by News; Knows Husband Will Make Good as Manager,” New York Times, June 4, 1932.